When making a large number of bracelets, I recommend using stretchy wire, so you'll have a "one size fits all" gift. Pretty crystal or glass beads are so inexpensive now and come in gorgeous styles. 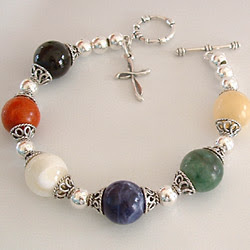 Choose 6 colored beads and fill in with silver or clear beads. 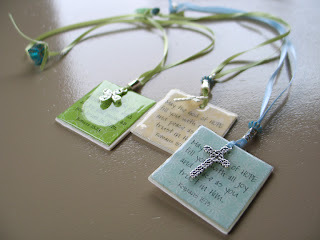 Print out pretty tags with the special meaning of the colored beads and you have a lovely, meaningful gift! I'll take some pics next week to show you the results of our crafting party! I couldn't wait to show you this year's idea as I know some of you are looking for ways to be a blessing to others in your groups this Christmas, too! I love your bracelet and the meaning behind it is so beautiful! We did that in my MOPS group one year. We did add a tiny cross along with the beads. I still have and wear it. A wonderful idea! Popped in from SITS! What a wonderful idea! I hope you have a whimsical Wednesday! Where can I print out the pretty salvation card, that goes with this pretty bracelet?